1 FOR SALSA, combine 1 tablespoon of the lime juice with habanero pepper in small bowl. Let stand 30 minutes, tossing occasionally. 2 Meanwhile, whisk together vinegar, oil and Knorr® Beef flavor Bouillon in medium saucepan over medium heat until Bouillon dissolves and mixture is hot; remove from heat and stir in onions. 3 Pour onion mixture into medium bowl; let cool. Stir in chili and lime juice mixture, tomatoes and cilantro. Set aside. 4 FOR TACOS, brown ground beef with Bouillon, chili powder and paprika in large skillet over medium-high heat. 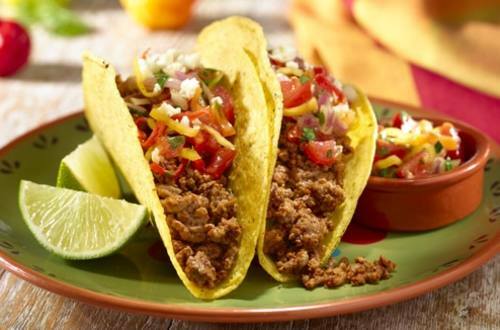 5 Evenly fill tacos shells with beef mixture; top with salsa, queso fresco and if desired, chopped avocado.